The Network Resource Manager allows you to block /unblock various hardware devices of different user machines. It is possible to enable or disable resources on multiple computers, all connected to a single Network at a time. One can also manage the hardware resources like all USB ports of a machine. Software will ask for the Domain name, Admin user name and its password to connect the machines on the network & displays USB status details to monitor working process of systems. As you provide the credentials, software will load and list the entire computers connected under that domain. As you provide the domain name and credentials, software will list all machines under the domain. Also, it is possible to manage or restrict the hardware resources of all those machines at once. But, software facilitates you to check or uncheck the machines to, enable or disable selective user machines. Get details of every machine available within the network once software is into process. These details include: machine name, USB status (Check, cross or unable to connect), OS (Windows operating system), System type (32 bit or 64 bit) and options to enable, disable and check compliance. All these help manage and control the current USB status. Network Resource Manager tool runs with Windows Server editions 2003 to 2008. Also, it gives you the details of all user machines connected under the provided Domain name of the Active Directory. For this, you need to provide the domain name and respective username & password. To know more about the history of USB status user can select the compliance check option which will give details of Domain name, machine name, last update enable, disable and current USB status with time and date of activity. With check compliance option user will get to know the last activity details performed on USB port connection. The greatest benefit of using Network Resource Manager is that the administrator can get entire USB status for machines under the domain name provided and thus, security of the system can be strengthened. It is possible to manage the USB ports of all machines at a time. The Network Resource Manager can be installed on any Windows OS (Win 8.1, Win 8, Win 7, XP, Vista & all below versions). And with Windows Server 2003- 2008 editions; which needs connection of client machine with the server via LAN network. Can I connect with two networks at a time? No, the software allows you to connect with single network domain at a time. Can I disable multiple USB ports from all Network Devices? Yes, you can disable individual or all USB ports from multiple network devices at once. Are network login credentials needed or tool automatically loads all machines? Yes, you must know the login credentials of the network, after that only the tool will load all machines with USB port status and system info. What does the Information sign under 'USB Status' mean? If you are getting an 'information sign' under 'USB Status' it means there is some error in reading the respective USB. Please go to the Help menu to troubleshoot this issue. 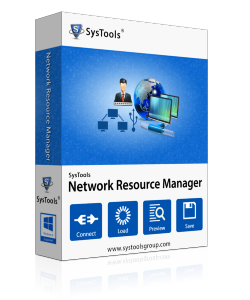 How does the SysTools Network Resource Manager work? The user needs to enter network credentials firstly. Tool will then load all devices connected to that network and also the status of USB port of each device. Then you can select individual or all devices to enable or disable their respective USB ports. SysTools signature style of making software applications can be experienced with Network Resource Manager too. The tool has precision, technique, yet is user friendly; which makes it so good for all types of users. Thanks to the developers for considering different user needs, so well. Network Resource Manager seemed a difficult application but due to the functions it was serving, it seemed important as well. Hence, we decided on giving it a try. Gladly, we made an immediate purchase soon after realizing how user friendly the tool is.